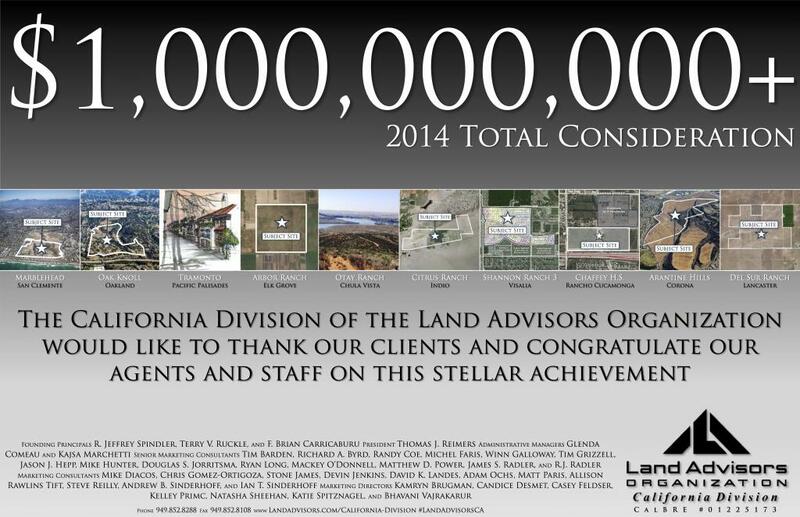 Thank you from Land Advisors Organization California Division! This entry was posted in Antelope Valley, Bay Area, Central California, Central Coast, Central Valley, Coachella/Imperial Valleys, Fresno, High Desert, Land Advisors News, Los Angeles Basin, Northern California, Orange County, Sacramento, San Diego, Santa Clarita Valley, Ventura County, Victor Valley, West Riverside Co., West San Bernardino Co. and tagged #landadvisorsca, 2014 Total Consideration, Arantine Hills, Arbor Ranch, Brokerage, California land, Chaffey H.S., Chula Vista, Citrus Ranch, Corona, Del Sur Ranch, Elk Grove, Indio, Lancaster, Land Advisors Organization California Division, land brokerage, Land Sales, LAO, Marblehead, master plan, Master Planned Communities, Oak Knoll, Oakland, One Billion, Otay Ranch, Pacific Palisades, Rancho Cucamonga, San Clemente, Shannon Ranch 3, Tramonto, Visalia by landadvisorsca. Bookmark the permalink.